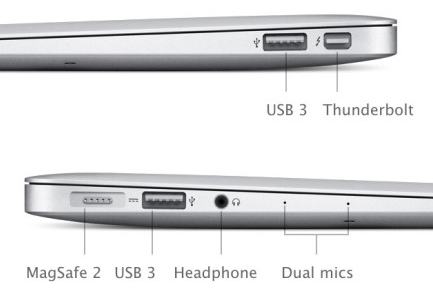 Your MacBook Air (MBA) features the following connections. Note that the terms “Thunderbolt” and “MiniDisplayPort” are sometimes used interchangeably. One is a bundled into one “USB Hub,” which looks a bit like a squid, . 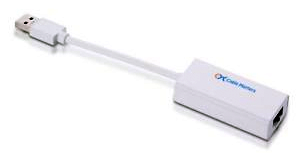 The squid connects your SmartBoard or your BrightLink, your USB speakers (if you have them), your document camera (if you have one), and your internet connection (through a USB-to-Ethernet adapter). Plug the squid into either of the two USB ports on your MacBook Air. The other is a VGA cable, which connects to your projector. On the MacBook Air, you must use your Thunderbolt-to-VGA Adapter, called a “dongle,” to use this connection. Plug the dongle into your MacBook air, then plug the VGA cable into the dongle.